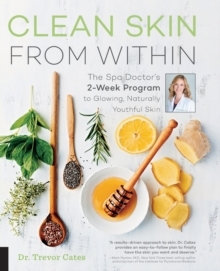 In Clean Skin from Within, Dr. Trevor Cates presents her detailed, customizable 2-week program to transform your skin from the inside out, including recipes for skin-perfecting food and drinks and DIY skin care products. If you have a common skin condition, such as acne, rosacea, eczema, or psoriasis, or are just looking to give your skin a boost, you can skip the trip to your dermatologist. Dr. Cates shows you how to achieve clear, glowing skin without the harsh medications by adopting a cleaner, healthier lifestyle. By addressing the root causes of your skin troubles, she will help you create a holistic plan for clear, vibrant skin in four simple steps:Clean Plate (diet)Clean Slate (toxin takeaway)Clean Body (detox support)Clean Mind (emotional cleansing)Dr. Cates helps you first to identify your skin type to determine what natural ingredients will best nourish your skin. Featuring recipes for collagen-boosting bone broths, antioxidant-rich salads, and delicious smoothies, you'll learn how to whip up fresh, wholesome dishes that promote healthy skin. This comprehensive guide also includes instructions for creating homemade skincare products such as cleansers, toners, exfoliants, masks, and more. At the end of two weeks, your skin will be polished, perfect, and ready to glow-and so will you!